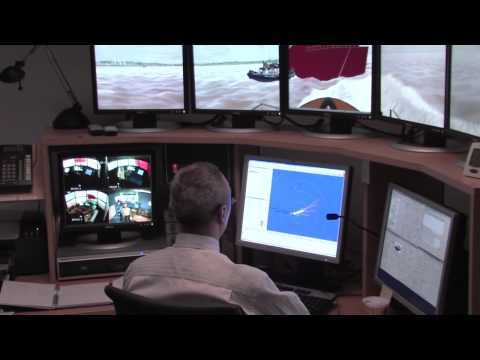 Located in Quebec City, Canada, the Maritime Simulation and Resource Centre (MSRC) is a leader in training and development, and holds unique expertise in navigational safety. It is open to all members of the maritime community, whether for training, professional development or the validation of economic development projects. It offers a stimulating work environment and an atmosphere conducive to learning and the exchange of knowledge. MSRC is a division of the Corporation of Lower St. Lawrence Pilots (CLSLP). The Centre’s mission is to ensure training and development for pilots belonging to the CLSLP and to share its expertise in simulation with other pilots and professionals in the maritime domain. In operation since 2005, the Maritime Simulation and Resource Centre (MSRC) has been purposely built to function as a total turnkey port procedural development centre. It is one of the few facilities in the world offering a full range of simulation options spanning from stand-alone desktop simulation to four fully interactive, manned tug and large vessel simulations. For projects requiring the knowledge of ship manoeuvres, the MSRC can draw on the vast experience of members of the Corporation of Lower St. Lawrence Pilots (CLSLP). The synergy derived from the combination of new technology with pilot experience generates exceptional added value for the MSRC and enables the Centre to offer unique expertise for projects involving navigation safety. MSRC also features an in-house database compilation capability, which permits to build, modify or customize simulated geographic areas, as well as ship models, to suit client specific requirements. This extremely unique combination of human and physical resources enables MSRC to provide flexible and total solution through all stages of port development to include: appraisal and conceptual design, manoeuvring procedure training for new facilities, data capture and reporting.